Question: We work with egoism on the human level. But how should we relate to desires on the still, vegetative, and animate levels? Answer: By the principle of vital necessity. Take only as much as you need. Everything else only bothers you. It is written, “The more property you have, the more worries you have.” If you are thinking about the human level, then on the rest of the levels you only have enough energy left for the vital necessities. For example, some people keep a dog at home. The dog barks loudly in the morning, demanding to be taken out for a walk. The two of them walk together: the master and the dog on a leash. I walk with my “dog” inside, while his dog is outside. Indeed, this “animal” needs to be taken care of. I feed it, walk it, wash it, put it to sleep, and do everything necessary so it would let me work spiritually. This healthy attitude makes life much easier. You have to put your material existence into simple, “mechanical” boundaries, subjecting it to the needs of the system like cogwheels in the mechanism of a watch. I have to get along with everyone and maintain a certain material balance in my family, at work, and so on, while devoting the bulk of my energy to the thing that matters most. We make many efforts, and with each effort we have to make the calculation, “If I don’t do it for me, then who will do it for me?” We must do everything possible and discern where exactly we should put forth efforts—in the unity with others, the place where the breaking occurred. We have to try to restore the unity of that broken place so it will become integral again, so we will all be as one man with one heart and live in mutual guarantee, meaning in perfect, systematic unity. Sometimes it seems to us that we are able to do this, and sometimes that we are unable. We want help, but cannot ask for it because we don’t feel the real need for it yet. Thus, stage by stage, a person lowers his head and gets ready to make new efforts. He starts working again and again in this broken place in order to reunite it. At the same time, he knows that he has to keep working until he comes to need help, and without that desire the help will not come. Yet at the same time a person has to believe that there is none else besides the Creator. Then every effort is followed by despair and a new necessity. A person has to go through all of these phases one after the other until he accumulates a great desire, until he reaches total despair in his own powers. That is when he breaks through the gate of tears with the right cry or request. All of his efforts come together, standing across from all of the Lights that came to him, causing him to despair and leaving him with a sensation of greater emptiness. He tried but could not find what he wanted, until it suddenly became apparent that he did not try, and he found. In other words, the action itself is not done by him, but by the Light, which carries out his desire and unites him with others into a single Kli. His efforts, help, despair, and cry—everything he accumulated at the previous degrees finally takes on the right form. Everything merges together into the right desire and the right decision. And all of this happens by virtue of all the things that a person has gone through on the path. Question: At what point does the Creator decide: “That’s it, I am done. I’ve submerged you in total desperation”? Answer: Is it worth worrying about it? The Creator is an unchanging force, an unbendable law, perfection, eternity, and consistence. There are no changes in Him; everything is up to me. Depending on which side I turn to Him with determines the kind of response I will receive, in perfect correspondence with the course aimed at the purpose of creation. The Creator is the world of Infinity (Ein Sof) where I’ll find the perfect Kli (vessel), the perfect Light, a perfect screen (Masach), and where all efforts, disappointments, successes, and everything else are collected. That is where my Reshimot (informational data) are leading me to. From this perfect state, from the perfect strokes of the final picture, I receive motivating forces, according to my personal state. I am guided forth by small doses of despair and strength, enlightenment and concealment, that is, by the multifaceted and intricate governance. I, however, don’t know in what combination these or the other beginnings will come. It is determined by the design of the soul that I attain gradually by advancing further and further. It is the soul where we attain the bond with Infinity, and hence, start to realize how the whole links together with its part, until they become one. Question: If only “desire” was created, then what is intention? Is it a type of desire as well? The truth of the matter is that we resulted from the breaking. Before us, there was a system of Infinity (Ein Sof), where the entire desire and the Light were one. Then we experienced the system of the breaking of the Kelim (vessels). What did it give us? 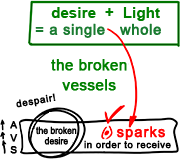 Now that we are here in the corporeal world, we still have desire, but instead of the Light, there are only sparks. Our desire is broken and acts solely with an egoistic intention to receive. In the course of history, from generation to generation, from lifetime to lifetime, it has developed at the still, vegetative, and animate levels. Finally, during one of its lifecycles, it reaches the final stage when a point, a spark of Light, the Creator’s part given from Above, emerges in a person. “What about me?” it asks as it wakes up to life, and that’s when man feels a conflict within. At the animate level, such internal conflicts don’t arise because at that point we were developed by instinctive impulses and urges. We wanted to use others to the utmost and succeed in all that we did. All people, young and old, strive to gain the most out of this world. They exist only in one desire: the will to receive pleasure. Thinking that it is worth living for, they don’t ask questions about something greater than that. After all, questions grow from within, from the fertile inner ground, and until then we are mere mammals. We view vital issues through the prism of our mind and various beliefs. This goes on until man despairs of the desire, until his or her point in the heart unfolds, which characterizes our generation. Thus, the point in the heart is the beginning of the soul. This is what triggers human development. We go through numerous lifetimes, remaining only in egoistic desire. Within it, we live and develop. It is our reality in this world. Essentially, it is only the point in the heart of each of us that undergoes incarnations while the bodies belonging on the animate level simply are born and die. Finally, after many lifetimes, the point in the heart starts doing its work. After all, the material desire has completed its development and has nothing else to do; it lost interest in trying to fill itself and doesn’t see an exciting future ahead. All of this helps the point in the heart to bring a person to the question of the purpose of life, of a more exalted existence than the material journey from birth to death. This is the beginning of the spiritual process. In nature, there are two forces: the will to receive and the will to bestow. The spiritual world is the world of bestowal, whereas the corporeal world is the world of reception. How then do we unveil the world of bestowal? How do we enter it? My point in the heart must face egoism which halts it. Yet, the upper force that expands from the integral network of mutual connection brings me to the group, the studies, and the teacher. Now, I have to work with the environment so that my will to bestow may rise above the will to receive. Having accomplished that, I will ascend to my first spiritual degree. It is grounded in egoism, but its essence is in bestowal. The stages of ascension are as follows: 1) My egoism is increased to match the point in the heart, 2) I have to trust that even if these forces are equally strong, I can reconcile them by having elevated my point in the heart with the help of the group and having chosen the value of bestowal over the value of reception, and 3) This is regarded as faith above reason. Later on, the process repeats: I receive greater egoism, which is confronted by the point in the heart that has also grown, thereby ascending to the degree number two. In this way, we climb the ladder of spiritual rungs, step by step. The key difference between Kabbalah and philosophy is that philosophy engages in abstract matter, while the wisdom of Kabbalah deals solely with form clothed in matter. Hence, philosophy is detached from reality, while Kabbalah is tied to it as is any other science. This desire has two forms of existence. Science that studies the behavior of the desire which strives to absorb and receive everything into itself is called material, natural science. “Material” means that it acts with the egoistic intention. Science that studies the actions of the desire to receive pleasure which aspires for bestowal is called Kabbalah. This form of existence of matter is absent in our world; it can only be found in the upper worlds. Hence, it is clear that the wisdom of Kabbalah is opposite to the material sciences for it explores the opposite behavior of matter, which makes all of their laws and principles cardinally different. Yet, they both use the same scientific approach of relying only on obvious facts. 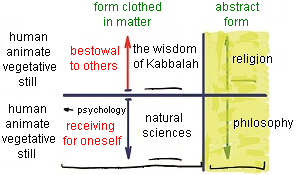 Accordingly, as the materialistic science studies the levels of egoistic matter, which exist in this world, so does Kabbalah use the same realistic, scientific approach to examine the existence of spiritual matter at the still, vegetative, animate, and human levels of nature, which act in bestowal in the spiritual world. To summarize, matter could work either 1) for its own sake, or 2) for the sake of others. In both cases (either in the upper world or in our world) a scientific method can be applied, meaning the method that relies on experience, reason, obvious facts, and the study of form clothed in matter. In addition, another approach can be used in both areas, which studies abstract form: philosophy and religion. Question: You have said that when properly taught, the new generation will naturally transition into spirituality without sinking into egoism. How does this fit with the notion that man comes to Light from darkness as he reveals the evil within? Answer: We exist in a very large system of souls that was created by the Creator. Now, instead of it, we feel our physical existence and broken interconnection. There is only one reason for this: our inadequate and faulty perception. And this is why we need to find out and learn how to transition to the correct perception. If we were to come to Kabbalists at a young age, they would have given us the education that we as children should have received. To educate means to accompany a child as his desires grow and impulses take over due to the changing Reshimot which unfold in the process of his natural development, and provide him with the means to manage them, properly arrange them, and weave them into the correct attitude towards the world. Today we teach our children to exploit the world, to enjoy it egoistically, and to use everything and everyone. Instead, we need to teach children an altruistic and friendly attitude towards the world, teach them love. This way a child simply receives a different education method from us and no more than that. “How will his evil inclination manifest?” The evil inclination does not go anywhere; it keeps growing, while we provide children with the appropriate means to correct it. So why am I teaching adults, who are also transitioning from the animate to the human degree, when I can be working with children? Today, all of them are born with inescapable questions about life. There is no need to wait for them to grow up and become full of animate desires. I can immediately teach them to be human. Parents must provide their children with education one way or another. And if my goal is bestowal and love of my neighbors, then would I really teach my son anything else? Of course, I will teach him the things I value. Our duty is to provide our children with a method that will bring them to the human degree. We clearly see what is happening in the public education system. And this is why we naturally need to do everything we can to ensure our children receive spiritual education. Question: Today there are many new students present at the lesson. What advice would you give them to change their egoistic intention into an altruistic one? Answer: In our world, we are approaching the moment of truth: We have nothing else to live for. Day by day, the world discovers that its life is empty. In reality, however, we haven’t reached the turning point just yet, and people still manage to confuse themselves and obscure the truth because they have no replacement for their present life. We have to show them that the alternative does exist, and that we are undergoing a certain process managed from Above. We have to actualize it. It is a unique, benevolent process, a remarkable development, elevating us over life in the body which is approaching death every given second. This is what we should pass on to the newcomers. We must rise to a new perception of reality. It doesn’t mean that I simply replace “my picture” I see from within the body. No, I don’t “switch the remote” on the external view, but rather I step out into a new reality, cross from one world to the other. I change my attitude in practice, by giving it a new vector: from within myself to outward toward others, or from within myself out to the Creator. In fact, “the other” is a remedy, an intermediary phase that helps me to aim to the Creator. In general, I can exist in my small will to receive pleasure, perceiving this tiny, frail world. Alternatively, I can break free from it and experience eternal life, the perfect nature, where I live without restrictions in the world of Infinity. The wisdom of Kabbalah gives us this opportunity. In the previous generations, only a few were able to experience such an internal revolution, the transition from one world to the other. But today, everyone whose point in the heart (or spiritual desire) unfolds can try to actualize it. Starting with our time and on, the entire human race will gradually, step by step, undergo this transition. Question: If I have an egoistic desire and a spark of bestowal, then who am I? Answer: You are the middle, you stand between them as the deciding force which shifts the scale. If you cannot arbitrate bestowal and receiving within you, their conflict will force you to do it, if only by way of suffering, through internal and even external wars. On the other hand, you can use the wisdom of Kabbalah which explains to you how to go through this process quickly and consciously. Question cont. : What determines my choice then if I am in the middle? Answer: It is defined by the environment that you have been led to. The Creator, so to speak, “places a person’s hand on the good fate,” but later on, you yourself should become rooted in the group and begin working with it. If you are sitting at the lesson right now, it doesn’t mean that you have found the right environment just yet. You haven’t found the essential tools yet: not the teacher, or the group, or the books. You received them from Above, but you haven’t shifted the scales yet. To do so, you must literally dig your teeth into the means you were given and use them correctly. You need to employ them every second by checking how and what else can be done. That is what constitutes your choice. Egoism constantly pushes you away from it, disconnecting you from the teacher, or the group, or the books, and distracting you with doubt and disdain. And if you overcome these difficulties, you advance. Let’s see if you are a real man. After all, “man” in Hebrew (Gever, גבר) means "overcoming" (Hitgabrut, התגברות), which allows you to raise one’s spark over all obstacles.